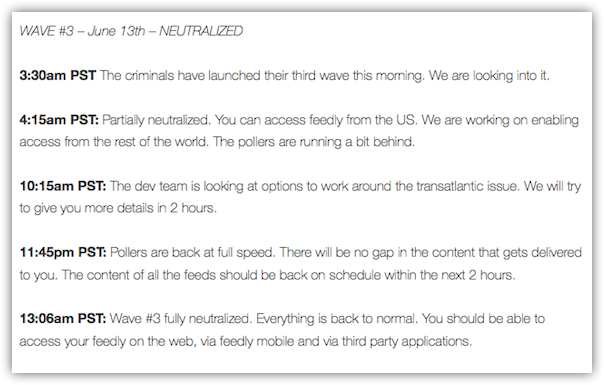 WAVE #1 – June 11th – NEUTRALIZED. 6:25am PST: We’re making some changes to our infrastructure that will allow us to bring feedly back online. However, these things take some time to put into place and it may still be a few more hours before service is restored. Thank you so much for your patience and for sticking with us. Remember, none of your data was compromised or lost in this attack. 15:07pm PST: We have neutralized DDoS attack that began at 2:04am PST last night. You should now be able to access your feedly from both feedly.com, mobile apps and third party applications. Our ops team is closely monitoring the situation in case the attacks resume. It might take a few hours for 40 million feeds we poll to get fully updated. We would like to re-iterate that none of your data was compromised by this attack. I would like to thank the ops team for working through the night to resume the service as quickly as possible. I would also like to thank the community for your amazing support! Note: If you are not able to access feedly.com it is most likely due to the fact that your ISP or computer is caching an old DNS entry. Please refresh your DNS cache or wait for it to expire. 10:17am PST: The criminals have launched their second wave of DDoS attacks this morning. The ops team has reviewed the attacks and is working on building a second line of defense to neutralize this new attack. To make breaching those defenses harder, we can not communicate as frequently as we would like on the status of our infrastructure changes. But this second wave, although stronger, should be neutralized faster than the first one. We apologize for the inconvenience. Thank you for your support and understanding as we work our way through these waves of attacks. 11:30am PST: The second line of defense is up and wave #2 has been neutralized. You should be able to access feedly via feedly.com, feedly mobile apps and third party apps. These criminals are determined to try to extort some money and we are determined to say no to extortion and focus on building a stronger feedly instead. Thanks again for your overwhelmingly positive support throughout the last 2 days. 3:30am PST The criminals have launched their third wave this morning. We are looking into it. 4:15am PST: Partially neutralized. You can access feedly from the US. We are working on enabling access from the rest of the world. The pollers are running a bit behind. 10:15am PST: The dev team is looking at options to work around the transatlantic issue. We will try to give you more details in 2 hours. 11:45pm PST: Pollers are back at full speed. There will be no gap in the content that gets delivered to you. The content of all the feeds should be back on schedule within the next 2 hours. 13:06am PST: Wave #3 fully neutralized. Everything is back to normal. You should be able to access your feedly on the web, via feedly mobile and via third party applications.